Can training in the martial arts help you in everyday life? 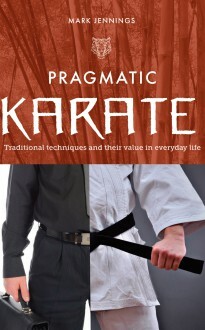 In Pragmatic Karate Mark Jennings argues that it certainly can. Provided you have a thorough grounding in the principles of this ancient fighting art and take the right approach, both physically and mentally, the karate moves you learn in the dojo can prove invaluable in a confrontation, or threatened confrontation, in ways more subtle that most people realise. Your karate training can even change the way you look at the safety of your family and your home. This is a detailed, authoritative work from a karate practitioner with 35 years’ experience who is also a long-serving police officer.